Bryan is from Canton, Ohio. He joined the United States Marine Corps in 1996 as an Infantry man and obtained the rank of Corporal. He was hired by Las Vegas Metropolitan Police Department in 2000. He was assigned to Northwest Area Command. While assigned there he worked Patrol, as a Field Training Officer, and in the Problem Solving Unit. He has been a firearms instructor since 2006. He then transferred to Narcotics Squad 8 in 2008. 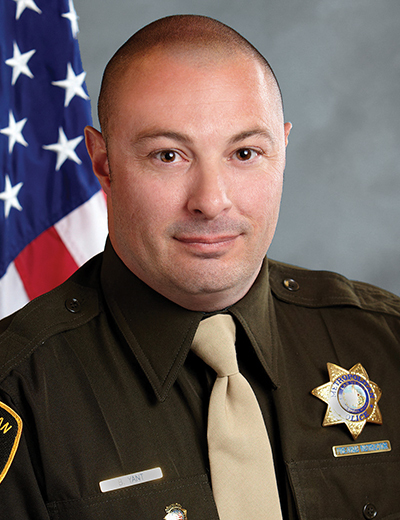 In 2011 he was assigned to the Southern Nevada Counter Terrorism Watch Desk. While assigned there he became the Headquarters Building B PPA representative. In 2014 he helped establish the Real Time Crime Center utilizing the Public Safety cameras along Las Vegas Blvd. He was appointed to LVPPA Executive Board in 2014 as the Secretary, and currently serves the membership as the Sergeant-at-Arms. In 2015 Bryan attended the 5 day certification course taught by Dr. Bill Lewinski of The Force Science Institute. In 2016 Bryan was selected to attend an advanced 400 hour course taught by The Force Science Institute. Bryan successfully completed this course and is an Advanced Force Science Analyst. The Force Science Institute is comprised of a world-class team of physicians, psychologists, behavioral scientists, attorneys and other leading professionals. They are dedicated to the unbiased application and further study of 150 years of existing scientific research on a wide range of areas associated with human factors, including the intricacies of human movement, action/reaction times, how the mind works during rapidly unfolding events, decision-making under stress, etc. Their goal is to provide information on human behaviors during high-stress, rapidly unfolding encounters to those who are tasked with evaluating and investigating the behavior of individuals involved in these events. It is their hope that they can support their efforts to ensure that these evaluations are thoroughly informed, fair and fact-finding.